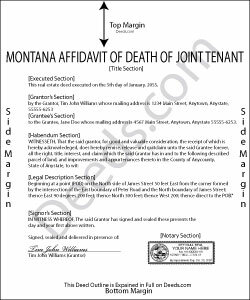 The Montana Affidavit of Deceased Joint Tenant form is appropriate for use by a surviving joint tenant, as identified on a recorded real property deed. Montana Code Annotated defines how joint tenancy is created at Section 70-20-105 and the associated right of survivorship at 70-20-310. Under 72-16-503, to formally initiate the process of perfecting the title, the surviving owner should complete and record an affidavit containing those matters required by 7-4-2613(1)(c). Among other details, this document should identify the parties, the property, and the recording information. Also include an official copy of the deceased owner's death certificate. Submit the affidavit and any other necessary paperwork to the clerk and recorder for each county in which the real property or any part of the property is located. This is an important step because it contributes to a clear chain of title (ownership history), which should, in turn, make future sales of the property less complex. It also serves as public notice of the change in the property's status. Each case is unique, however, so contact an attorney for complex situations or with specific questions. Deborah C. said: I would recommend these forms to others. Reply from Staff: Thank you for the follow up Peter. Have a great day!